Earlier this month, John Boyega sent out the first set photo from the highly-anticipated sequel Pacific Rim: Maelstrom, as filming began in Australia, although it only showcased the script cover that confirmed the official title. Today we have our first look at the actor in action on the set in Sydney, Australia. We don't get many clues about what scene he's filming, but the actor seems to be either chasing, or fleeing from, someone. The Daily Mail debuted these new photos from a set that was build over the weekend in Perryman place in North Cronulla Beach. This is the second Australian location used for the sequel, which started filming this month in Queensland, Australia. The sequel received $20 million grant for production from the New South Wales (NSW) government. Very little is known about the story, but, back in July, original Pacific Rim star Charlie Hunnam confirmed that he will not be reprising his role as Raleigh Beckett, due to scheduling conflicts, although he did add that he is still excited to see the sequel. No story details have been released for Pacific Rim 2 quite yet, but the first movie was set in a world where humanity was forced to build massive robots known as Jaegers, to fight giant monsters known as kaiju and stop them from destroying the entire planet. 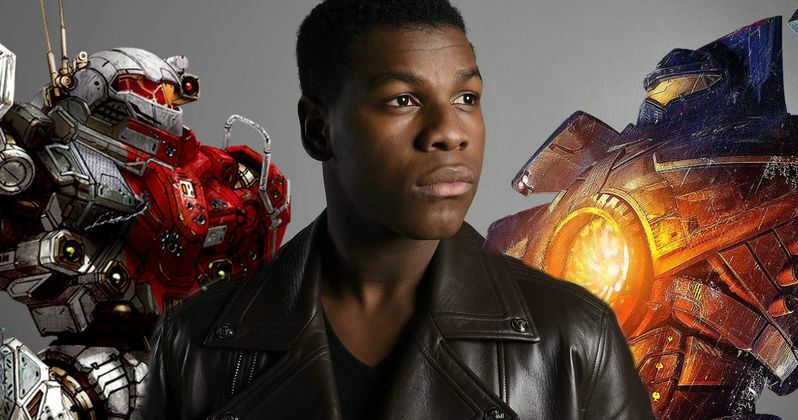 John Boyega is playing the son of Idris Elba's Stacker Pentecost from the original Pacific Rim. The supporting cast also includes Scott Eastwood, Tian Jing, Levi Meaden and newcomer Cailee Spaeny as the female lead. It has also been rumored that Pacific Rim: Maelstrom may include original Pacific Rim stars Ron Perlman (Hannibal Chau), Charlie Day (Dr. Newton Geiszler), Rinko Kikuchi (Mako Mori) and Burn Gorman (Gottleib), but they have not been confirmed yet. In related news, Shyrley Rodriguez has been added to the cast of this sequel in an unknown role. She will be joined by a number of Chinese actors including Zhang Jin, Wesley Wong, Lily Ji, Chen Zitong, Lan Yingying and Qian Yongchen, with Xiao Yang and Korean actor Kim Jeong-Hoon appearing in cameo roles. Steven DeKnight (Daredevil) is directing the sequel, taking over at the helm for original Pacific Rim director Guillermo del Toro, who is still aboard as a producer. The screenplay has been worked on by a number of writers, such as Guillermo del Toro, original Pacific Rim writer Travis Beacham, Jon Spaihts (Doctor Strange), Kira Snyder (The 100), T.S. Nowlin (The Maze Runner trilogy), Zak Penn (The Avengers) and Derek Connolly (Jurassic World). Take a look at the first set photos with John Boyega in action on the Pacific Rim: Maelstrom set.